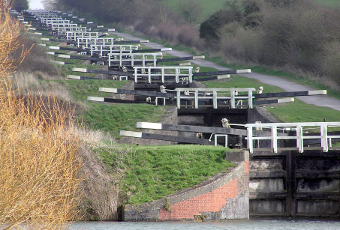 British Waterways report that the bottom gates of Lock 24 on the flight have been irreparably damaged by a boat, and the flight will be closed until July whilst the gates are replaced. The flight was immediately closed for 'an assessment of the structural stability of the gates', but it was considered that the gates were beyond repair. Over the period of the winter stoppages, these gates were due to have been replaced as part of 16 in need of replacement on the flight, but only 12 were actually done, leaving others in a somewhat precarious state. Such was the condition of the bottom gates on this particularly lock that they could not withstand the impact of a boat, so a costly emergency with the result that boaters again suffered the consequences of the closure of one of the most popular flights on the system. What must be so annoying to boaters, is that instead of money for the maintenance, £50,000 was spent on removing fish from the flight to restock the Grand Union Canal; £35,000 spent on a two years scheme for 'reeds and bank enhancements'; and then the publicity stunt that attracted 30 reporters of removing carp that were eating the dragonflies! We are told that the entire flight will remain closed until the 6th July, with the promise from British Waterways that it is 'working hard to open the navigation as soon as possible'. Luckily there are a pair of gates available, that can be made to fit, but it will still take nearly two weeks to complete the work. So once again boaters will have their holidays curtailed, which is occurring more and more as the system lacks proper maintenance.